Hooray………all 4 boxes for the Hilligoss Galleries shipment are packed, boxed, a consignment sheet printed and the FedEX labels all attached. They won’t actually ship until Monday so they don’t languish in a distribution center over the week-end. Something about this process reminded me of being a mom…getting my babies out there to face the world. You work for years to do the best you can to nurture your creativity and you have to have the discipline to get in the studio, learn your craft/art techniques, and come up with a body of work you can be proud of. You have to buckle down and learn how to present yourself, your work and market it …………….then, when the time is right, it/they go out into the world on their own. You hope for the best. Whatever happens or not, if you’ve done your best, you can feel good. Okay….so now to make more of this work, I’m too old for babies. Busy busy busy……….did I mention busy? That’s the way things are around here for quite some time. We had a wonderful Thanksgiving with all my kids and grand kids, even a few extras at the farm. We just set the table with what we could find there and with what we brought in. 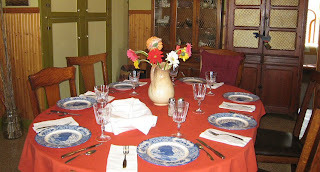 I even set the kitchen table with the blue and white turkey plates. My daughters brought flowers, my son in law went out to the woods for autumn branches. Good thing that there were a few attractive ones left from all the wind we’ve experienced lately. We even found my mother in law’s grandmother’s old buttermilk pitcher to put the flowers in on the table. 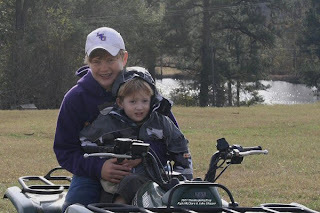 The kids brought their four-wheelers and son in law and son went hunting and got two deer. Great aunt cringed when she heard all the rifle shots as she just can’t bear thinking of shooting “Bambi”. Studio time is practically non-existent right now……….but soon, soon, I’ll have time. Christmas will be quiet since one part of the family is traveling to Idaho. But back to packing up about ten paintings…………I have a new gallery showing my work in Chicago. Hilligoss Galleries at 520 Michigan Ave. Go by if you’re near or visiting Chicago. The cooking marathon is winding down for today. I’m getting tired of power outages around here though. And right in the middle of my pumpkin pie. This is the one (low calorie with no crust) my daughter had on her lists of MUST make. At least it wasn’t the pie with the crust as it wouldn’t have fared as well in a 40 minute outage. The temperatures dropped in a few hours from 80 to 50’s…and about time as I had to turn on the a/c yesterday with all the baking. I’ll mix up the sweet potato casserole in the morning and bake it at the farm. All cutlery so I’ll have enough for 16 people and some extra tablecloths along with all the food I fixed and head over there in the morning. Maybe I should stop for some flowers along the way if I have the time just in case there is no time for branch gathering. The fridge is groaning……….the dressing needs a touch of salt but less is better than more. The UPS man just delivered my prize for winning ” Best Design” in the Summer Creative Catalyst exhibit recently juried by Ann Baldwin. How nice that I got an Arches watercolor pad and a Canson drawing pad and a certificate……presents already and not even Christmas. I hope all reading this will have a wonderful Thanksgiving with all the people you hold dear. I won’t warn you to watch what you eat after making the chocolate pie that could be called “high cholesterol pie”…..but it my husband’s favorite so I have to make it. From the title…you know what this means. The marathon is the two days before Thanksgiving and/or Christmas Dinner. Chopping and dicing….making lots of cornbread for dressing has begun. No bread in this East Texas dressing either….100% cornbread, eggs, onions, celery, sage, salt and pepper to taste and plenty of broth from a hen…no turkey. Turkey is a whole separate thing. Gotta have that good ole fat hen or it just won’t do. My son and his wife are bringing a Cajun fried turkey from Louisiana…okay.. okay…only 65 miles across the state line but it’s a good line anyway. It’ll be something new like the year my son in law made tur-duck-in…or however you spell it. I keep thinking I’ve got to make something more healthy and less of it, too. You know that never works since everyone has their favorite thing that we really MUST have. I’ve been to the grocery store a couple of times already but I must remember to get another fridge ’cause there is never enough room. Then there is the fact that I can’t make up my mind between a couple of different sides so I buy for both just in case. No time for homemade rolls this year either. I try to make them every year but this year I’ll be hauling all this to the farm 30 miles away and I just can’t do it all and haul it, too. Another thing…no microwave and a huge kitchen with hardly any working counter space and work pattern is non existent. I have to do it all mostly here. Wish I could have the time for walking down through the pastures and woods looking for branches and leaves for decoration like my mother in law used to do. This year I’m dedicating this Thanksgiving day to our dear papa and granny. They passed away 18 days apart in Sept/Oct…..We had so many wonderful holidays over there at the farm/ranch, and now they’re gone. Maybe we’ll have the place next year, and then, maybe not so this year is the year. It won’t be the same without them and their generosity and love of sharing a good meal and talk with the people they love most….but we’ll try. Oh yeah….the Rachael Ray mention…..such a lovely, energetic young woman and she was on TV when I started this…so I remembered her tip for having a “garbage bowl’…..good tip, too, Rachael. Maybe someday I’ll have my TV and computer in range of the kitchen so I can actually listen and write without running all over the house. A Whirlwind still….I don’t leave here until noon…or the airport anyway. The trip to Chicago has been so much fun. I’ve never been to this city and it is bustling and moving all the time. The Gold Coast B & B was a fantastic place to stay and situated so well for getting around the downtown areas. One of my Paint-l friends, Elin Pendleton and her husband were here and staying at the B & B and that was also a real plus. The Hilligoss Gallery owner asked me to send him some digitals of my work. It would be a good place for my work….we’ll see what happens.My diptych looked wonderful in it’s place in the show, if I say so myself. It could be seen from the front door of the gallery when entering…on the staircase leading up to the second level. The gallery does a wonderful job of lighting, too. There were two evening receptions so time for just getting out and about was at a premium. I finally got to the Art Institute yesterday. I didn’t want to miss the Jasper Johns “Gray” show that just opened. Although I thought gray would be a little too much for me, I was intrigued by his work, the mark-making and layering. I should have bought the catalog since it appears to have wonderful photos of the work…I’m.too cheap so I’ll get it later maybe online. I look forward to reading more than you can read walking around reading wall cards. No photos were allowed for temporary shows so I don’t have any. 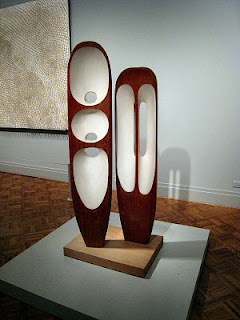 I did take a few of other works in the Permanent Collection….then remembered I didn’t take a photo of the wall cards for them so I only remember for sure a Kurt Schwitters, and Barbara Hepworth piece. Leaving the Institute there were protestors about the war milling around and a fellow playing sax…what a combination. I walked for a ways and even came across the “Bean” and other sculptures in parks as I walked. 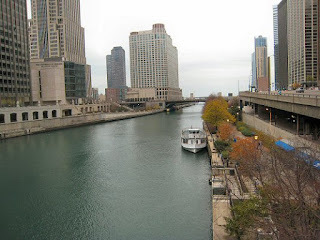 Then I even crossed the Chicago River and took this picture from the walkway.